“We had an amazing response from a last minute notice asking local buddies who support Yes to come into the town centre for a photo,” said Yes Paisley campaigner Mags MacLaren. “Show your support for Yes and pick up free badges, posters etc: Yes Paisley campaigners will be outside Paisley Town Hall today at 1:30pm for a photoshoot – be part of the picture to show that Paisley is turning Yes”. By 1:30pm more and more people kept appearing – and as there was a wedding taking place at the Town Hall, Yes Paisley quickly took a few photos outside Paisley Abbey and then asked the Yes Buddies to walk up to the cenotaph for another photograph. In the end there were over 200 buddies who attended the photoshoot. The Yes Paisley stall in the town centre and the Yes Paisley shop in Old Sneddon Street, were mobbed with people wanting posters, badges and other items to show their support for a Yes vote. “We were surprised at the number of people who turned up for the photoshoot. 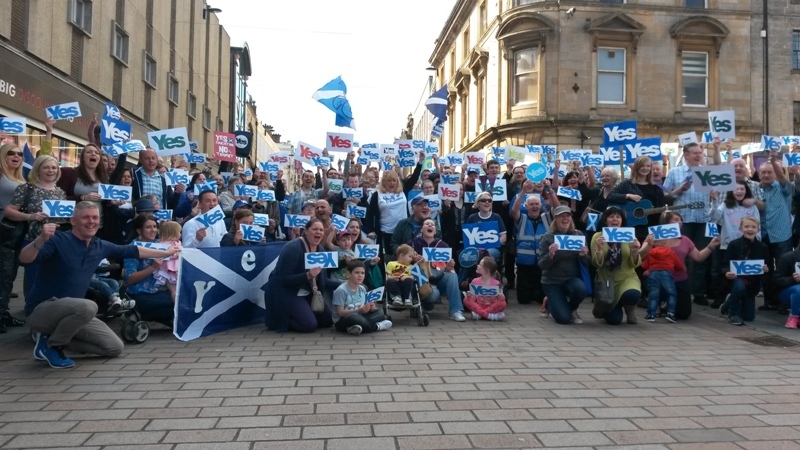 We were already holding a stall in the Town Centre and thought a bigger group photo of Yes supporters would be good so we issued a call via social media and were shocked by the turnout. “We brought along a small PA system to play some background music to keep people entertained until we took the photos and then when we realised there was a wedding at the town hall we decided to walk up to the cenotaph – next to our stall – to take more photos there. “Derek Mackay MSP also turned up and addressed the crowd, thanking them for turning up and encouraging them all to get involved in the campaign to make sure that the Yes campaign wins the referendum. More photos from the day can be found here.